Red Lion first established itself as a provider of superior Industrial automation products, earning nationwide recognition for being the #1 panel meter company in the United. Looking to broaden its product portfolio, Red Lion acquired Paradigm Controls, a UK-based leader in the operator panel market, in 1996. 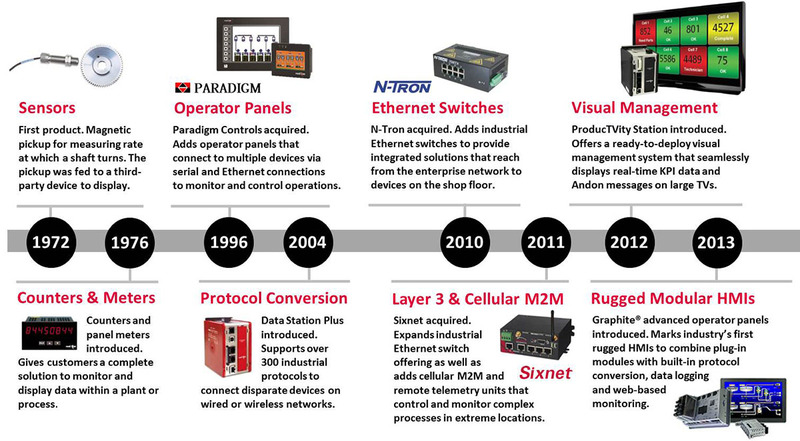 In 2010, Red Lion – realizing the potential of Ethernet for industrial applications – acquired N-Tron, a well-established manufacturer of hardened industrial switches. The combination of Ethernet with automation enables customers to not only communicate and display data, but also move data from the manufacturing plant through the enterprise. The following year, the company added industrial RTUs, layer switches and cellular M2M products with the acquisition of Sixnet, a leading provider of industrial networking solutions for markets such as power, utilities, transportation, maritime, military and more.